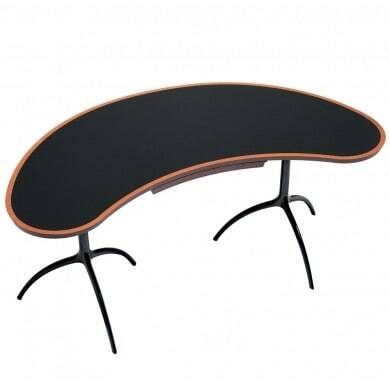 Desk with structure in polished or stove enamelled die-cast aluminium, top in veneered plywood (thickness 25mm). Drawer in plywood. The three-leg structure in die-cast aluminium, polished or stove enamelled, is the main idea of this collection, consisting of armchairs and stools, with seat in Viennese cane, tables with top in wood or in clear crystal glass. The aesthetic and functional features make each piece ideally suited for a variety of applications, in the home or the home office. The swivel easy chair Young Lady, the stool young boy and the tree table stand out in this collection, available in different configurations: low, high and with adjustable heights, this table elegantly furnishes the living room. The high version and kidneyshaped top with drawer is simple but refined and presents itself as an complete desk. Do you have a question about "Tree Table"? How can we contact you?